Each challenge of our lives is an initiation. Can we keep breathing deeply, our jaw soft, in the face of stress, challenge and crisis? Me and an impressive circle of standing stones in a random cow field in Kilmartin. I’m fresh from the shamrock-mint green, mist-soaked landscape of west coast Scotland to the drought-ridden, west coast desert of my homeland. California, once laden with an infinitude of indigenous spiritual sites on a coastline worshiped by the Native Americans as the home of the spirit world, has long since been bulldozed over by colonialism. While the traces of ancient spiritual practices of our indigenous ancestors may be challenging to uncover, on the west coast of Scotland, in Kilmartin Glen, you can’t throw a stone without hitting a site of ancient spiritual significance. The Celts were, as all Earth based cultures, a nature revering people. The creative use of stone was not only how they marked community gathering spaces and spiritual ritual sites, but how they tracked the movement of the planets, the seasons, ancestral lineage and wealth and expressed themselves through artwork. In fact, you might want to reconsider even throwing that stone- considering it could quite possibly be marking the spot of a mass burial cairn. Kilmartin’s optimal placement as a major ancient trading port makes this one of the richest concentrations of surviving spiritual sites in the world, officially containing over 350 monuments within a 6 mile radius. While in California, you can be pretty sure any remaining structure created prior to 1800 will be celebrated as a state monument and commemorated with, at the very least, a plaque, in Scotland, the stone henges where Druids met 2,000 years ago to ensure the future of their people unobtrusively dot the kelly green cow fields on the side of the road. If we count the profuse amount of gargantuan, one-off standing stones and mysterious stone etchings sprinkled (seemingly) helter-skelter across the misted landscape, the number of historically significant structures jumps closer to 3,000- in a six mile radius! The ancient Celts were no stranger to ritual. In fact, all earth based cultures live by ritual, marking the movement of the moon and the planets and Earth’s shifting seasons, praying for abundance, celebrating death, new life and all the shifting seasons in the lives of human beings and communities. Ritual is about consciously creating a space and a time in order to find yourself, ironically, outside of space and time, in order to connect with the whole- the universally mysterious flux of which we are part. Ritual has largely disappeared in our culture. Among this Scottish wonderland of rain-kissed natural stone monuments I found myself in, these testaments to humankind’s will to find the deeper meaning of their soul reflected in nature, I’ll never forget one particular pile of giant stones I encountered in the middle of a breathtaking pasture between an icy loch and age-old mountain speckled with sheep. Guided by a local kilt-clad Scotsman, my fellow pilgrims and I were instructed to climb through a tiny crawls space into the womb of the earth, underneath the stones. Mystified and confounded, we found ourselves in a 4 x 10 foot underground cave, covered over by rocks and earth. This was a 5,000 year old initiation chamber, made sturdy enough and continually commanding the reverence of the locals in order to survive, fully intact, up until the present. Initiates included newly chosen leaders, spiritual and political, undertaking the responsibility of guiding their people, girls stepping into the responsibility of womanhood after their first blood, seekers entering the sacred path of mystical exploration and every day people-turned-pilgrims seeking guidance from the source of all wisdom and creation, the Earth-womb herself. The underground sauna at the retreat center I stayed at in EcoYoga in Kilmartin, my own personal ritual pleasure space. One of the few places that contemporary ritual still spills into modern life on California’s west coast: yoga class. For a few moments, through the portal of our bodies and the ancient tool of our breath, we transcend space-time, connecting with the depth of our essence even while grounded in the pleasure of our own form. Underground initiation chambers also once existed on the coast of California. While we mourn the loss of the spiritual lineage of our own land, today, without needing a physical space to seek inner truth, we can still reconnect with this innate impulse of our forebears. Wherever we are on our home planet Earth, wherever we are in the calendar of eons, we are just like those who suffered willingly on vision quest on top of or underneath the Earth. We share this same exact urge to understand our own significance in the seeming chaos of existence. Can we think of the body itself as an initiation chamber? The contemporary initiation: can we keep breathing deeply, our jaw soft, in the face of stress, challenge and crisis? Hell, can we sit at our computer during our workday without our shoulders climbing towards our ears? Each challenge of our lives is an initiation. The purpose of initiation is not to impart or impose wisdom and knowledge from the outside but to inspire us to tap into our own internal source of power and wisdom, our internal compass, nature within our own bodies. In fact, I believe this is the true purpose of all teachers and all institutions of learning. The simplest way to connect to contemporary ritual is to go into nature. When we tune into the shifting cycles of our home planet, we are transported out of time, to the eternal present, the same space where we meet all of those who walked this path before us, alternatingly confused and lonely, heartbroken and disillusioned by death and darkness, and filled with joy and inner strength, passionately in love with themselves, the world and their lovers. When we find ourselves in nature, if we calm our minds enough to pay attention, we automatically feel a sense of grounding that allows us to naturally inhabit our bodies more fully. An enhanced sense of embodiment translates to improved postural alignment, a heightened sense of meaning and confidence and an amplified sense of ease and lightness that comes from the organic release of fear and anxiety. Scotland pilgrimage crew. Thanks for bringing us together, Yogascapes. Rituals of self-care are rituals of connecting to the Earth and her cycles. Planning a consistent weekly hike, going to yoga class, receiving or offering massage, eating or cooking food from the ground- all of these are ways to experience nature in the form of your body, to connect with the space of ritual, which is beyond time, constantly nestled in the nowness of the present. These are also ways to fortify our bodies as the sites of our deepest initiations, the space from which we ask and sometimes answer the hardest questions, the space from which we offer back to something grater than ourselves, the space from which we will, one day, hopefully, walk bravely into the ultimate unknown. 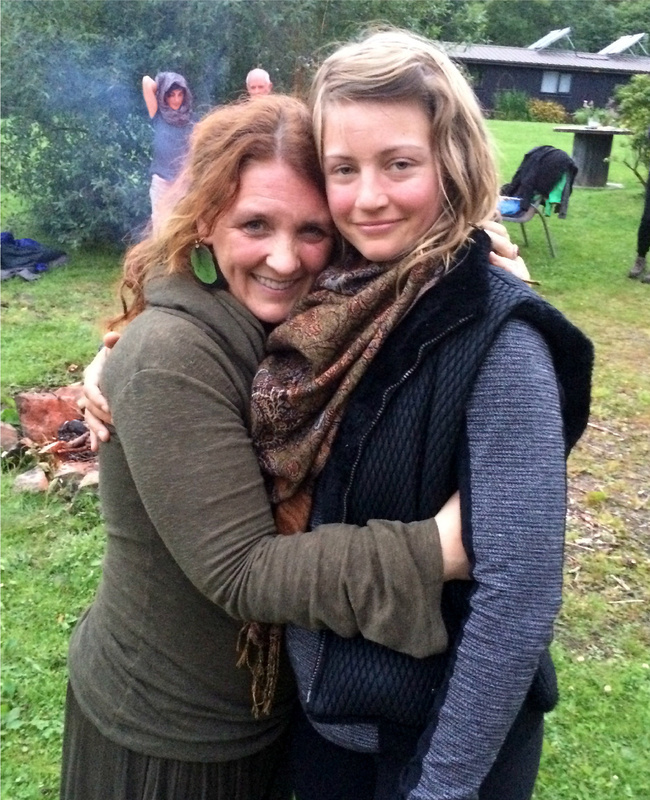 Me and my dear teacher and priestess, Abby Tucker. We are going back to Scotland in August 2016. Join us!